When an Indian anti-satellite weapon shot down an Indian satellite 300 km in space in just three minutes, India became only the fourth country in the world to join an elite club, of nations with anti-satellite missile systems, after the United States of America, Russia and China. How big is this DRDO-ISRO achievement? 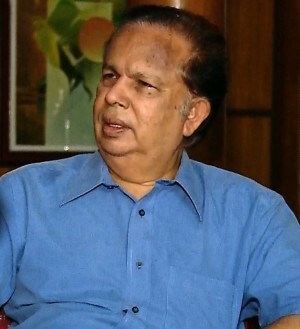 G Madhavan Nair, former ISRO chairman and now a member of the Bharatiya Janata Party, tells Rediff.com's Shobha Warrier, "It is like the atomic weapon. It shows we have the strength, but will be used only for self-defence." 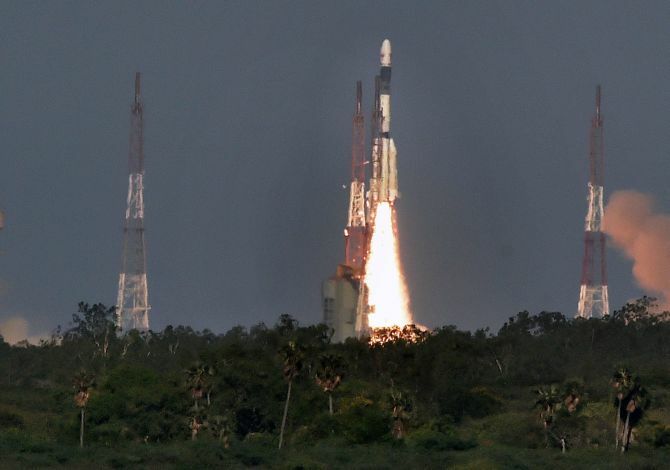 How big is this achievement for India's space research? Space has become an integral part of our society for most civilian applications and for some defence applications depending on the space-based system. So, protecting this space-based system is absolutely important for the country. Developing the anti-satellite weapon is a step towards that. This is actually a self-defence mechanism, you can say. When we have satellites serving the people of the country, when a non-friendly country wants to attack us, the first thing they may target would be our satellites. In such a situation, it is important that we have the capability to intervene such an attack, if at all it happens. Also, in case the attack escalates, we should be able to take counter measures. So, from that point, it is like the atomic weapon. It shows that we have the strength, but will be used only for our self-defence. In case we are driven to the wall, it can be a system to be used against also. How do you describe the technology used in this? Technology-wise, it is very intricate. Though we know about rockets, trajectory, tracking system, etc, synthesising all these into a total new system and then demonstrating in real time is something that is of great technology challenge. DRDO was taking the lead in this mainly. And they have achieved it. With Mission Shakti, as it is named, have we become a space power or a military power? Space technology is something that needs to be protected and the defence system missile which can tackle any unfriendly spacecraft is an asset as well as a self-defence system. So, it is a major milestone, a synthesis of the rocket system, tracking, mission computation and decision-making. It is the coming together of all these. We have demonstrated to the world that we could do it. The military significance is the system which can be designed as anti-missile can derive many elements out of this. For example, there is a commonality between the anti-satellite weapon and the anti-missile system. What is the difference between an anti-satellite weapon and anti-missile system? What does an anti-satellite weapon do, strike down missiles? No. We can down any flying object in the space which is hostile to us using the anti-satellite weapon. The anti-missile system works like this: If somebody launches a missile to us, and we detect it at the appropriate time and send our missile to intercept it in the air and perhaps, destroy it over their land itself. At the time of a war, you mean? Yes, at the time of a war, the anti-missile weapon can be used. Today, Russia and America have perfected this technology. China also have it. We can use this technology in anti-missile weapons also. Has any country used it anywhere? I have not heard of anyone using it so far. But there were many demonstrations where they launched their own missiles over the sea and intercepted them from another ship. An anti-satellite weapon can be used in space wars, they say. What does it mean? We are heavily dependent on our space assets for our national needs and development. So, if at all somebody wants to corner us, they would first try to destroy our space assets. Before they destroy our space assets, we can intervene and destroy their system using the anti-satellite weapon. So, an anti-satellite weapon is a defence system. Now that India has this, others will think twice before attacking our space assets. This is to safeguard what we have developed. For example, how do we protect the power stations and dams that serve the people? If some unruly element targets them, we stop it first. This is exactly like that. The difference is this is to protect what is there on space. So, if somebody were to target our satellites which we use for our day to day life, we have to stop it before they are destroyed. The international treaty stipulates that space should not be weaponised. All of us are bound by this treaty and we will not make the first attempt to weaponise space. It is more like a precaution, I would say. Did DRDO and ISRO work together in developing this? No. ISRO's role was in launching satellites while DRDO was responsible for developing this. The satellite was launched by ISRO and it was struck down by DRDO. Why do you think the prime minister himself announced this? You can say what we have done is something similar to Pokhran, but not of that magnitude. Next level, so to say. Theoretically, it has been there for 10 years or so, but at a nascent stage. It was Modiji who gave the thrust to the whole programme in the last couple of years. He took a bold decision to go ahead and demonstrate to the world what we have achieved. Naturally, he can take the credit for that. Political will and decisive power are very important in matters like these. He has shown that he is well above all the previous prime ministers in that respect.